People are excited about Google Fiber. The search giant's foray into gigabit fiber optic broadband service represents an important catalyst for the industry, while also embodying a potentially disruptive threat to incumbent cable companies that are intent on holding America captive through high prices and slow speeds. The company has also picked up the pace. After the initial rollout in the Kansas City area, Big G subsequently announced expansion into Austin, Texas, and Provo, Utah. Those back-to-back announcements were encouraging signs that perhaps Google had grand ambitions to expand Fiber's reach. Could Google potentially roll out Fiber nationwide and really put the heat on the cable companies? Don't hold your breath. Market researcher IHS doesn't think it's feasible for Google to deploy Fiber nationwide, even though the Austin and Provo announcements were so rapid. 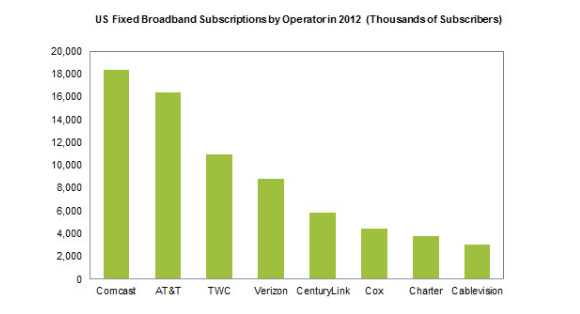 Google will always be a "minor player" in the U.S. broadband market, according to IHS. Rolling out on such a scale would simply be too expensive. The researcher estimates that the total population within all the currently planned cities is about 1.4 million, or about 0.4% of all U.S. households, which is fairly close to my initial estimates before Provo was announced (Provo has a relatively smaller population of an estimated 115,000). Even if Fiber were to dominate the markets that it's available in, Google would have only about 0.2% market share of all U.S. homes. In comparison, Comcast has 18.3 million broadband subscribers, AT&T has 16.4 million, Time Warner Cable boasts 10.9 million, and Verizon enjoys 8.8 million subscribers. The broadband industry favors large incumbents, because of high infrastructure costs that inevitably result in an oligopoly market structure. AT&T and Verizon have shifted their focus away from the wired side, content to let Comcast and Time Warner divvy up the business, in order to focus on the high-growth wireless segment. Google has very little chance of making a meaningful dent in these companies' overall subscriber bases unless it's willing to invest billions in infrastructure. IHS analyst Dexter Thillien doesn't think Google will be willing to match how much AT&T and Verizon have plunged into their own fiber networks over the years. However, Google has some cost advantages. By slowly rolling out in select locations after receiving incentives from local governments, it can offer lower prices than its rivals. The flip side is that competitors can request similar incentives to build their own networks, much in the way AT&T did when it announced "intent" to upgrade its fiber network in Austin if it could score the same incentives. Google Fiber is very much what Internet service should be, but making it a reality is much easier said than done. The article Google Fiber: Not Coming to a Town Near You originally appeared on Fool.com. Fool contributor Evan Niu, CFA, owns shares of Verizon Communications. The Motley Fool recommends and owns shares of Google. Try any of our Foolish newsletter services free for 30 days. We Fools don't all hold the same opinions, but we all believe that considering a diverse range of insights makes us better investors. The Motley Fool has a disclosure policy.